Technical Car Experts Answers everything you need: how to remove the dash trim on bmw? 1. We'll start with the dash trim... Start on the passenger side on the end closest to the door. 2. Use one hand to push the dash away from the trim. 3. While holding the dash slide the screwdriver under the trim. If done right the screwdriver can be placed under the trim with out touching the side of the trim. 4. Gently pry up on the trim, working slowly. Position the screwdriver so it is in the center of the trim. 5. Pry the trim up until you can get your fingers under the edges. 6. Slowly pull the edge until it release from the clip. 7. Now start working on the end near the radio gently pulling on the trim as close to the retainer pin as possible. 8. With the passenger side trim off the radio trim is next. One side should be already loose; the other side comes off just like the other trim. 9. Remove the trim by the headlight switches the same way. Working from the side closest to the door in. 10. With the entire trim removed take the new trim and install in the reverse order. If you have aluminum or painted trim it is a good idea to wax it before installing it to help keep it clean. 11. Now on to the shifter trim... remove the shift boot by pushing in the side and pulling up. The boot will pop out easily. You do not need to remove the shift boot to do this. 12. Pull the boot up and over the knob so it is out of the way. 13. Remove the two Phillips screws. 14. Lift up the trim from the back to expose the wires. 15. Disconnect the passenger side window controls. 16. Driver side window controls. 17. Lift the trim off the shift lever. 18. To remove the window controls there are two tabs next to each other. Compress the tabs and the controls should come free. 19. Install the window controls in the new trim. 21. Put the trim in place. 22. Tighten the two Phillips screws. 23. Snap the boot back into place. 24. Now we'll do the harder part, the door panels... to disassemble the door, start by removing the triangular plastic piece that sits on the cabin side of the rear view mirror base. Get your fingers behind this piece on the top and pull out. Once that pin is released, slide the piece up and pull out to remove (see picture to understand pin and slot location). 25. The next step is to remove the door panel. This can only be accomplished by removing the five torx screws securing the panel. 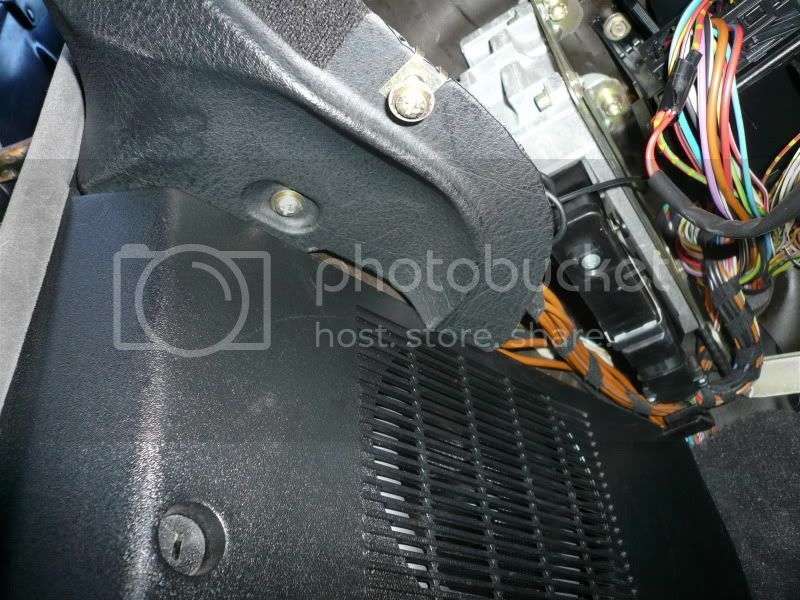 The image shows the location of the screws. The three in the armrest can simply be unscrewed, but the other two are a little tougher to get at. Behind the door handle, you'll find a small circular cap that is hiding one of the screws you need to remove. You're going to want to push on the side to the rear of the car as there is a gap in the lip behind this cap. The second picture tries to show this, though it is a bit blurry. Push on that side and you should be able to pull it out from the front pretty easily. The other difficult one is behind the plastic piece that says "AIRBAG". 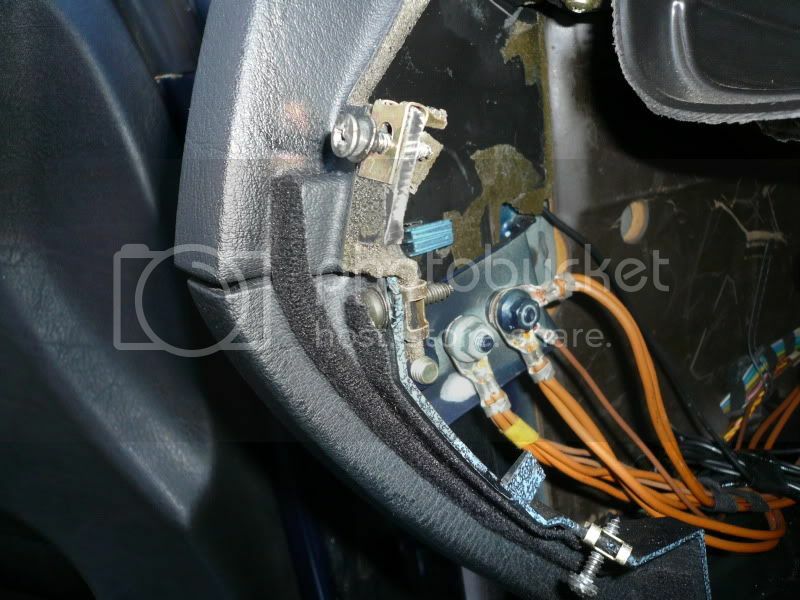 Before you start, look at the image of the piece out of the car to understand how it secures itself in the door panel. Take a flat head screwdriver and insert it behind the piece on one side, perpendicular to the edge of the piece (see image). Push in to compress the clip and pry the piece out. You should be able to get one side out and then move to the other and remove it in a similar fashion. It may take some coercing, but the piece should come out relatively easily. 27. Now that the door panel is completely removed, you will need to remove the 6 torx screws securing the arm rest to the door panel. BEFORE YOU DO THIS, if you do not have a torque wrench you will want to pay attention to which screws are which. These screws are torqued to a certain amount of force and are marked with white paint. Pay attention to which screws go in which hole so that when you reinstall them, you can turn them to their original torque. If you have a torque wrench, simply read the force necessary to remove them and when you put them back in, torque to that force. 28. From here, just remove those 6 screws and you've got the armrest in your hands. All that is left removing the leather(ette) pad. To do this, get your fingers underneath the FRONT of the pad and pull up. You must go from the front as there is a small tab in the rear (see second picture) that you will break if you try to pull up from the rear. This is going to take a fair amount of force but it will come out. Work your way from the front to the back and remove all 6 pins and slide forward (because of the aforementioned tab). Now just take those clips in the holes that the pins went in and put those in your new armrest, reinstall the leather(ette) pad, and fasten to the door panel using the 6 torx screws. Remember to screw them in at the same force you took them out at (you arive at this either by lining up the white marks or by torquing back to the same force it took to take them out). 29. 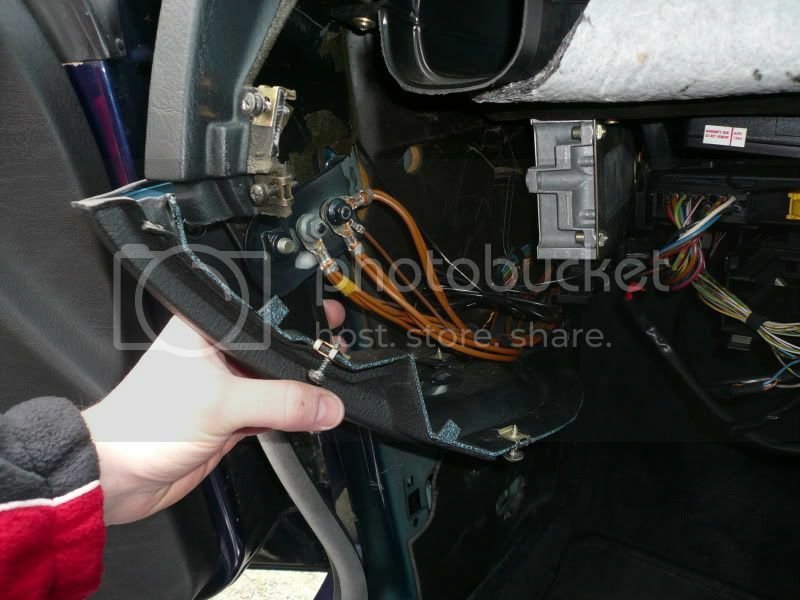 Reconnect all of your speakers, mirror joystick, and door handle cable, and snap your door panel back on by hitting the door panel with a closed fist around the edges. You will hear the clips engaging. Put those 5 Torx screws back in and your AIRBAG piece and the small circular piece behind the door panel and you're done up front. 30. Now the only thing left is to do the rear door panels... start by removing the rear seat bench. This can be accomplished by lifting the bench on either side until you hear and feel a clip (one on each side) disengage. Once those are disengaged, pull the seat bench out and set it aside. 31. Remove the two screws in the rear arm rests shown to the right. 32. To remove the rear seat door panels (even though there is no door there, I will refer to them as the rear seat door panels for the purpose of this how-to) you will need to remove the weatherstripping/trim on the door jamb. Simply pinch it and pull it away from the door jamb as shown to the right. 33. With the weatherstripping out of your way, you can get your fingers behind the panel. Before you remove this, I found it was a good idea to fold the seat down on the side that you are working. Fold the seat down and begin working your way around the panel by pulling the panel away from the outside of the car. Again, you will hear the cilps disengaging. Since the seat is folded down, you should be able to get enough clearance to pull the panel away from the outside of the car and get it out of there. Disconnect the speaker wire and you've got the panel in your hands. 34. Remove the 5 Torx screws that are securing the rear armrest. Again, if you opted for the rear side airbags, these will be marked with the same white paint that the fronts were marked with and you will want to follow similar protocol - make sure to torque back to spec. If you don't have the rear airbags, this isn't an issue. 35. Now remove the leather(ette) armrest pad in the exact same manner done above (work from front to rear). You will notice that these armrests work in the exact same way as the fronts and now that you are a pro, these should be no problem! Now just reinstall the armrest pad in your new armrest and fasten to the panel using the 5 Torx screws. 36. Reinstalling this panel is not the easiest thing, so I will cover the process I found to be most effective. Start by positioning the rear of the panel right where it wants to be... with the seat back folded down, you should be able to get enough lateral movement out of the side of the seat back to get the panel in there. Reconnect your speaker wiring harness. With the rear part in position (pay attention to rear retainer clip circled at right), move to the front corner of the panel closest to the floor and sneak this corner behind the trim (see second picture). Now just make sure that your clips and pins are lined up and push the panel on. At this point, do not worry about the window trim as you can slide your finger along there to fix that (see third picture). 37. Reattach that weatherstripping on the door jamb and put those 2 screws back in the armrest and all that is left is the other rear door panel (done in the exact same manner as the one you just did) and the seat bench. 38. The best way I found to put the seat bench in was to put one side in below the armrest with the other side resting on the other armrest. The seat bench will flex enough that you can sneak it below the armrest and slide it back into position. Push back and down from the front of the bench until you get the two clips to engage. Make sure to reposition your safety belts and you're all done! Once the glove box is removed you can remove the lower half dash trim by undoing two screws, one at the top and one underneath. Labels: how to remove the dash trim on bmw.